Emulator used: JPC-RR r11 (should also sync in r11.1-r11.2). 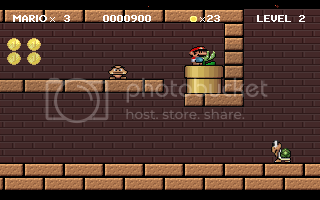 Mario&Luigi is fanmade freeware PC Mario game. If you hit corner of block, Mario will go bit inside the block and get ejected. This will gain 2 frames per pop if done correctly. Pressing left+right simultaneously causes Mario to turn instantly. Entering the pipe is faster than doing the straight route (additionally the straight route has nasty piranha plant). One can do the beginning section faster but then wrongly timed piranha plant will ruin everything. Now I can just barely enter the pipe without dying. That piranha plant prevents entering pipe. Otherwise some close calls but otherwise nothing special. 3 corner boosts (one can't get three boosts in row from that three block sequence due to insufficient spacing). The first section gets 4 corner boosts (the section does continue, but continuing would be time loss). Cornerboosting before the 6 tall cliff really loses 6 frames. There's forward pipe, but it will lose time (even without the piranha plant messing things up). Oh, and in the end, one can pull off left+right to save about 3 frames. Entering the pipe with piranha plant (in level 2). Nach: This run provides only a miniscule amount of entertainment. The game while technically impressive for what it does with few resource requirements, feels very much like an incomplete demo. Runs need to impress, and this game doesn't seem to provide much of an opportunity to do so. Rejecting.